To finish up my two weeks of fitness and CBD information I want to end with my very favorite post-workout snack which is CBD infused hummus and pita bread BOTH made from scratch! You can definitely purchase either in the store but they’re so easy to make that I often find myself just doing it myself. I prefer to use Pure Hemp Botanicals 300mg Full Spectrum Tincture in mine but you can also use Pure Hemp Botanicals Frost! To start let’s make the hummus. I prefer dry beans to canned personally so I tweaked the recipe when I made it and used dried beans and cooked them in my Instant Pot! I’ll add some instructions on that below* in case anyone else wants to try it! 1-2 Droppers of Pure Hemp Botanicals 300mg Full Spectrum Tincture. Place all ingredients, except water, into a food processor. Blend until smooth, adding water slowly until you get the desired consistency. Transfer your hummus to a serving bowl and enjoy! If you’re like me and you want to make your hummus with dried chickpeas simple follow these steps! I used 1 1/2 Cups of dried Chickpeas for my hummus. Pour the chickpeas and 1 teaspoon of the salt into the pressure cooker / Instant Pot and add water to cover by 1 inch. Cook on high pressure for 50 minutes. Allow the recipe to naturally release. The chickpeas should be tender and soft. If not, cook at high pressure for another 5 minutes, then manually release the pressure. Drain the chickpeas. That’s it! Then you just add them in like you would canned chickpeas! 1½ cups + 2 tablespoons lukewarm water, not hot and not cold. Add all the dry ingredients to a large bowl, making sure to keep the salt on the opposite side to the yeast. Add the olive oil and enough of the water to make a firm dough. You might not need all of it or you might need a few drops more. It depends on the flour you are using, humidity etc. Stir well with a spatula until the flour is absorbed and you have a shaggy dough. If the mixture looks a little dry add a few more drops of water very gradually. Scrape your mixture onto a clean and dry surface. If you think you will find kneading like this difficult then grease your surface and your hands with some olive oil. This will make it easier to handle. Try not to use more flour to knead on or add more flour during the process. If you do you risk your pita bread becoming dense and tough. Start kneading. If you are not experienced in kneading dough I recommend you watch a video of how to knead to help perfect your technique. You will need to knead for 7 – 10 minutes. Your dough will start out a little bit sticky but the more you knead the smoother and less sticky it will become. The dough is firm so quite hard to knead. That is normal. Keep going until it feels smooth and when it is in a ball shape and you squeeze it together on each side, it bounces slowly back to shape when you let go. Roll each piece out into a circle or oval shape about 3mm thick. 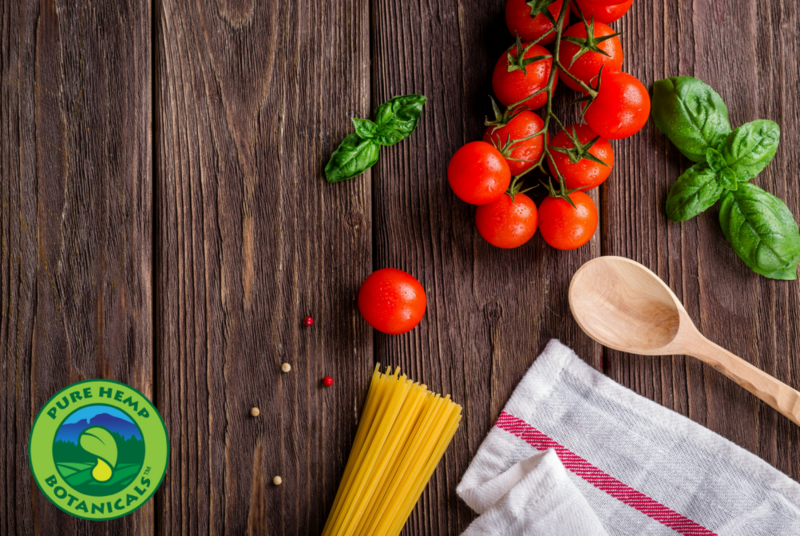 Place on a lightly floured baking sheet(you will probably need 2 baking sheets ) and cover gently with clean, damp dish towels. Preheat your oven to 500 degrees F while you are waiting. After 30 minutes uncover your pitas and gently flip each one over. You will need to peel them off the tray but this should be pretty easy to do because of the flour underneath. Place into the hot oven and watch through the door. Bake for 5 – 6 minutes. They will have puffed up nicely but not be colored at all. When you remove from the oven they may feel a little hard but cover with a dish towel and leave to cool and they will soften up. That’s it! Now dig on in! 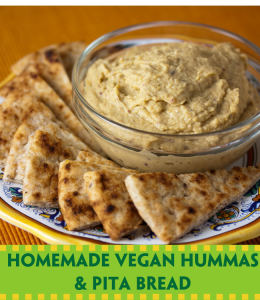 Hummus and pita bread are an amazing protein and carb packed post-workout snack. Feel free to adjust the hummus flavor to preference! Need your CBD ingredients for your hummus! You can find them here!